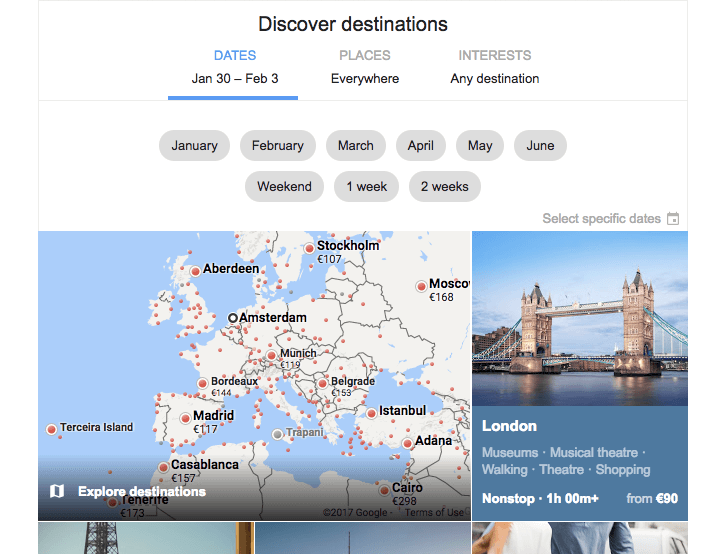 Google has recently launched Google Flights, a comprehensive travel tool that provides users a great view at booking options, if you want to find out what’s a better deal: Oslo or Stockholm or when’s a better time to travel: May or July, then you should try out Google Flights. The great thing with Google Flights is that but the tool provides more than the average flight aggregator. Looking to compare airfare or get destination ideas? Google Flights can guide your trip from research to booking. What sets Google Flights apart from other flight aggregators is by allowing the user to not only book flights, but also research destinations. If you have not decided yet where you want to go, Google Flights‘ map setting gives a detailed view of average ticket prices for cities across the globe. Google Flights also lets users search by interest. The “flights” category separates trips into themes like city destinations, weekend destinations, and more. The flights tab can be broken down further by interests like food, shopping, and adventure travel. With Google Flights you can view ticket prices based on dates. After selecting a destination, you will have to choose specific dates to and from your place of choice. Each day in the calendar will have a specific price listed underneath, allowing you to see the price for specific days. This is what I love this tool. Google Flights allows you to track airfare both by flight and destination. List flights by price, duration, airline, or stops. Once you’ve chosen a flight to track, you can view a timeline of the ticket price history. Google Flights provides an email notification option when prices change. If you have a destination and dates in mind, but not a specific flight, you can also keep tabs on overall pricing by city. This will give you the overall cheapest flight price available on those given dates to that destination and will notify you if that price drops. Google Flights not only breaks down the price, time, and the date, but it also gives you a look at onboard amenities. Learn if your flight will include Wi-Fi, in-seat power, and—our personal favorite—get the lowdown on legroom stats at your seat. Google Flights will also give you little tips as you move navigate through your search. This can include hints about price drops for traveling on different days or landing at a different airport. It will also tip you off if a more luxurious liner is available for a similar price. Google Flights makes it incredibly easy to share your travel plans. Email your itinerary out or create an embeddable link to send along to a friend. You can also share your itinerary on Facebook, Twitter, and Google+. Not sure what happen, when you added the comment. To give some advice, first you need to know the topics (e.g. cycling, technology, fashion) that you want to blog about. Find the topic that you are most passionate about (e.g. road cycling or mobile app development). When you have your topic, find out who your blogging competitors are, and then find a niche, so you can stand out from them. And start writing, things does not come immediately, it takes time to build up. When you found your niche, you need to know who will be reading your blog. For example, I blog about mobile app development. My ideal readers are people who are interested in exploring the development of their own mobile apps. Find your writing style, that best resonate with your potential audience. Write interesting content, by telling your story. Every person is unique, and your story is an important one. The important part of storytelling, however, is removing the superfluous details that make the story uninteresting. Foremost Keep It Simple. Stick to the basics and remove anything you don’t need. Remove anything that doesn’t add value. Picture. Put a picture of yourself on your blog. People identify with other people. Everyone has a story to tell, find the story that you can tell.